I've been sitting on that news for a while, but I wanted to wait until the inspection and closing period were finished (or close to finished, at least) before I officially announced the news on my blog. Careful readers will know that I've actually been searching for a house to buy since the spring without too much luck. Currently, the housing market in Portland is incredibly tight, with low inventory and high demand due to low mortgage interest rates. The good houses routinely stay in the market for one to two days, almost always selling for a price way above the listed asking price. Truth be told, the entire house buying experience was a little harrowing — I looked at so many houses that I lost count and made several offers that were outbid and rejected. And even when my bid for a house actually got accepted, I'm not gonna lie — panic set in long before excitement arrived. I mean, here I am, only 26 years old and buying a house, alone, by myself. Was it really such a good idea to throw all my life savings into one pot? Besides, as a fairly ADD person who'd spent the last three years living in three different cities, was I really ready to settle down in one city? If that city is Portland, Oregon, well then... yes. I love it here. I've lived in several different countries and cities, but nowhere else has felt more like home. There are so many things that I love about this place that I can't even begin to list them all. How I can ride my bike across the city on roads designated specifically for cyclists. How I can spot blackberry bushes, banana trees, and 6-feet-tall sunflowers all on the same walk through my neighborhood because the city is so verdant and lush with greenery. How a beautiful, million dollar mansion in the ritzy Northwest district has chickens loose in its front yard. However, perhaps my most favorite thing about Portland is how lucky we are in terms of food. Portland is an amazing culinary town, offering all sorts of cuisine and dining experiences for a steal, especially when compared to other big dining cities like San Francisco and New York City. Oregon as a whole has an amazing bounty, yielding copious amounts of fruits and vegetables. Fresh produce is always available at any time of the year. To announce my exciting news about my home ownership, I knew I wanted to make a celebratory recipe. Specifically, a boozy libation of sorts. But what's more celebratory than a glass of red wine after a long, hard day's worth of work? Or in my case, a long, hard few months of house hunting? It's perfect when enjoyed on a warm, summer's evening. I can't wait to eat a bowl of this beautiful sorbet from the front porch of my new house! I'm not much of a wine connoisseur, but I made sure to use a dry (that is, not too sweet), full-bodied Pinot Noir because the sorbet base uses a lot of sugar and raspberries. I'd consult with the wine stockist at your super market for recommendations because truthfully, I walked into my local New Seasons and literally asked, "What's your cheapest, dry Pinot Noir from the Willamette Valley?" 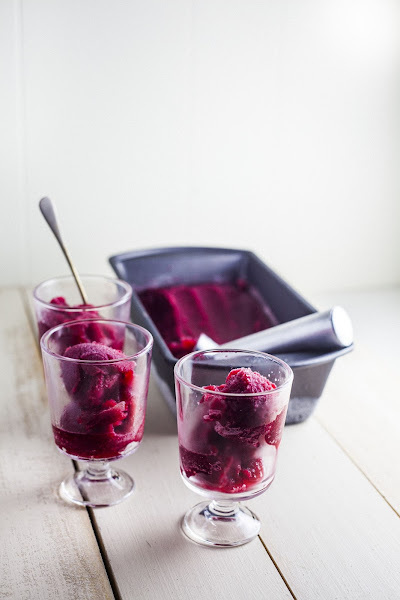 Chill the sorbet base until cold before churning it — because the sorbet contains a lot of alcohol, it needs to be chilled in the coldest part of the fridge for several hours before it can churn properly. Even after you've chilled the base, the sorbet will still have the consistency of a 7/11 slurpee after it's been churned for the appropriate amount of time. It must be frozen for several more hours to be firm enough to serve, so plan accordingly. 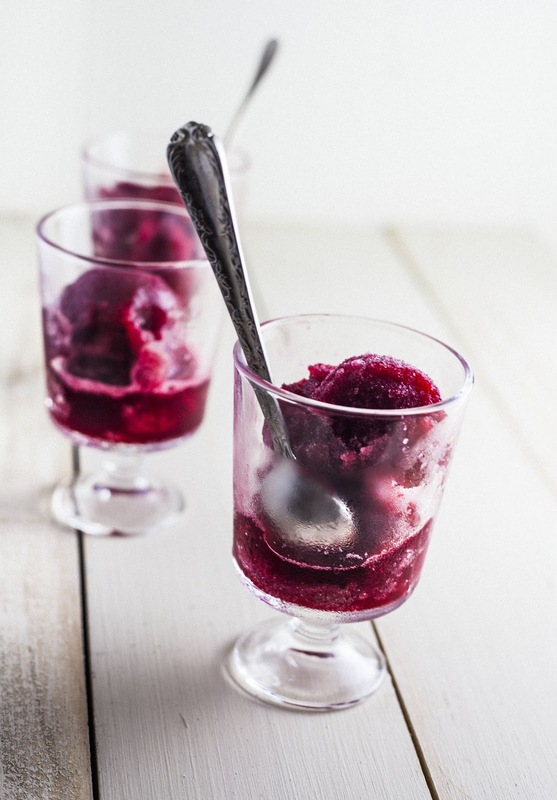 It's best to use this sorbet within a few days, because after that, the wine flavor begins to fade. You can use this recipe with a variety of other wines and berries! I would try substituting the raspberries with blackberries, or combining blackberries with a Cabernet Sauvignon. Combine 2 pints fresh raspberries, 1 1/2 cups granulated sugar, 1 cup Oregon Pinot Noir, and 2 cups water in a saucepan over medium-high heat. Bring to a boil, stirring occasionally to dissolve the sugar, then reduce the heat and simmer for 15 minutes. Remove the pan from the heat and pass the mixture through a fine-mesh sieve. Let cool to room temperature before refrigerating in the coldest part of fridge for at least 3 hours, or until completely chilled. 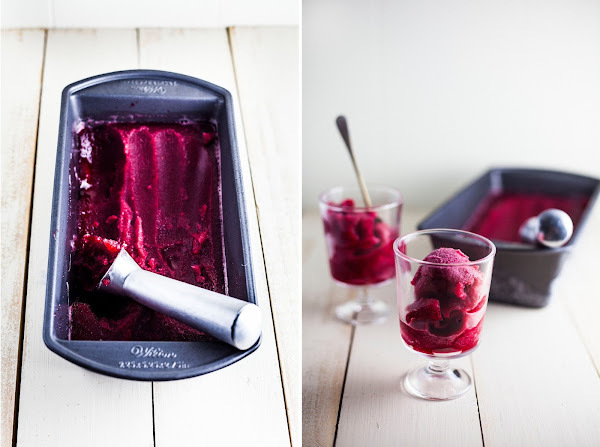 When the sorbet base is chilled, freeze in an ice cream machine following the manufacturer's directions. 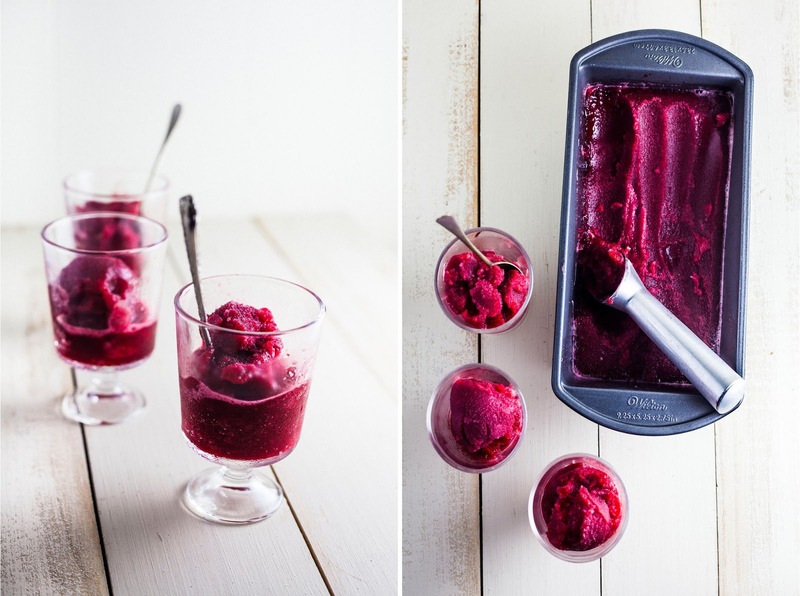 Transfer the sorbet to an airtight container and freeze for several hours until firm, preferably overnight. Congratulations, Michelle! What an exciting step & life milestone. 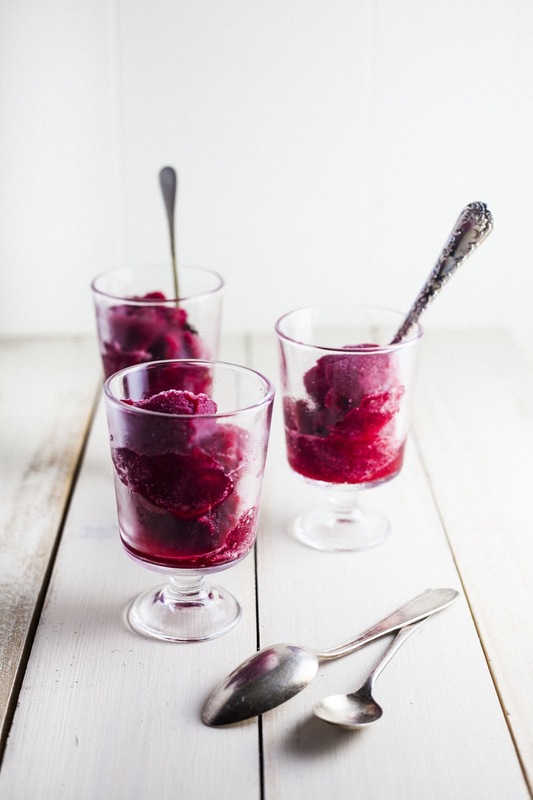 And I love how you've celebrated it- this sorbet sounds delicious & looks so striking against the white background. Gorgeous! Congratulations! You definetly chose a right place, I can tell by the way you write about it. I feel like I need to visit Portland! You sorbet is beautiful. Good luck.